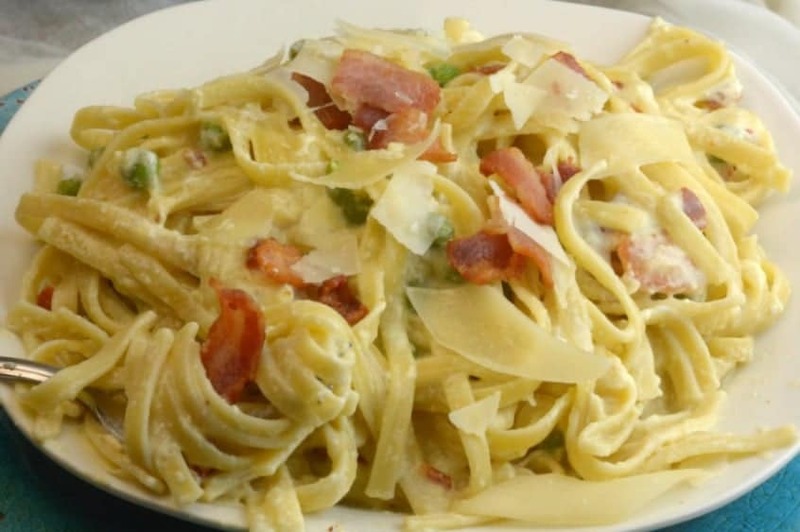 Take a trip down the Italian road with this Instant Pot Pasta Carbonara recipe. Tender pasta, bacon, in a creamy carbonara cream sauce that will knock your socks off. Trust me, you have to give this recipe a try if you are looking for that perfect pasta dish for your Instant Pot. This pasta dish is a huge favorite in our home. Let me say nothing beats pasta Carbonara in my books! I love cooking Italian foods, and the Instant Pot sure does make my prep even easier. A one pot Instant Pot pasta Carbonara that gives you that authentic Italian flavor in a fraction of the time. I hope you also enjoy my Instant Pot lasagna hamburger helper. Instant Pot Carbonara is well worth the extra calories. 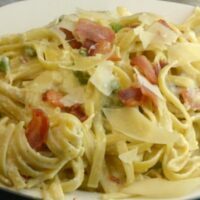 If you like authentic Carbonara Sauce you can make it in the Instant Pot without losing any of the flavors. Bacon, Pasta, and Cream should be the main ingredient in every single Instant Pot recipe. Once you cook your bacon in the instant pot make sure you use that Grease to cook your onions. Do not worry about the raw eggs at the end they cook while mixing from the heat of the pasta. I hope you enjoy this recipe as much as we did. 10 Instant Pot Copy Cat Recipes Is another great source to find more great Instant pot Recipes that you will love. I have found that the stove top method vs electric pressure cooker, the pressure cooker wins hands down. I share the full instructions below on how to make my homemade pasta carbonara. 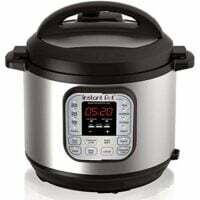 The Instant Pot works great at really pressurizing and locking all the flavors together. So you end up with a really savory flavored pasta at the end of this. Carbonara should have cream and eggs. That is what gives this such the depth in flavor and a thicker sauce texture. I reach for heavy cream, I find it works best. You will find that the pasta will lightly cook the eggs and it will then become the base of a creamy sauce for the noodles. Many think you are eating raw eggs, but even if you put this dish on the heat to ensure the eggs get cooked through, you will still get a creamy consistency over say scrambled eggs, based on the method of cooking the eggs. You can use a spaghetti or linguine noodle for Carbonara. Depending on what I have in my pantry will depend on what I use. Using a thinner noodle like angel hair doesn’t work as good in the pressure cooker. I recommend using linguine or spaghetti for sure. 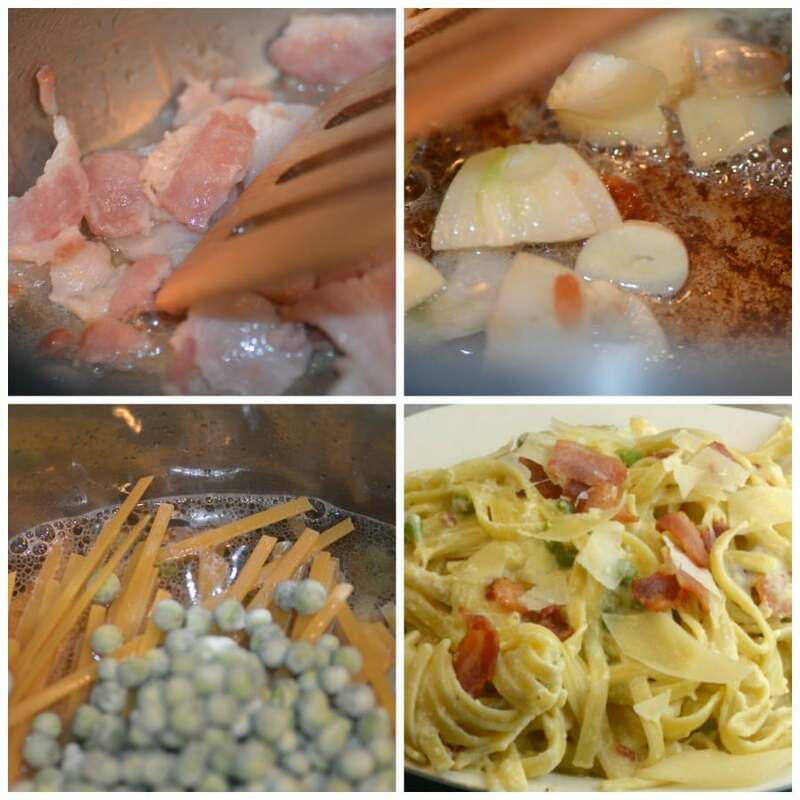 Give my quick and easy Pasta Carbonara a try this week. I think you will enjoy the simplicity of the dish with vibrant and bold layers of flavors. Instant Pot Pasta Carbonara is creamy and delicious garlic and bacon mixed in this wonderful Carbonara cream sauce gives your tastes buds a little party. Place your IP on saute chop bacon into little pieces and cook in the IP until golden brown. Remove bacon from the IP and set aside. Chop garlic and onion place in IP and cook for an additional one minute until garlic and onion soften cooking in the bacon grease. Place uncooked pasta, water, and peas. Cook on manual high pressure for 5 minutes. Meanwhile, Whisk together half the cheese and 3 eggs. Do a quick release Stir in egg mixture and heavy cream. continue to stir until pasta is well coated. Top with leftover cheese and bacon. Enjoy! So you are tossing the pasta in 3 raw eggs? I’ll have to try this version, I’ve never made it with heavy cream. This sounds good…Hope to try this next. So to make Chicken carbonara just add pieces of cooked chicken? I just added a bit of pepper as the pancetta supplied enough salt for those watching their sodium intake. great meal with garlic bread on the side. Thank you Adventures of a Nurse. Do you put the bacon back in while pressing cooking or do you put it in at the end? Grated parm or fresh? I’d put fresh on top, but what about the rest? In my experience, the grated stuff in the can won’t melt properly into sauces, it tends to clump. But if you don’t want to grate that much parm, just buy the fresh grated stuff in the deli or cheese aisle. We go through a lot of grated parm, so we buy the freshly grated Cello brand from Costco to save money. It’s with the rest of the refrigerated cheese. We fill a quart mason jar to keep in the fridge and store the rest in the freezer. It’ll keep for months. Did you drain the pasta? There’s no need. Pasta cooked in the IP with 1 cup liquid per 4-5 ounces (by weight) of pasta is just right. Your sauces will thicken on standing for a minute. I use this ratio for all of my IP pasta recipes. Just weigh the pasta and you won’t go wrong. Is that 2 or 4c water for the pasta? as it was drier than I’m used to, but it was definitely good.